Ajit kumar was worried for his basic needs of his family. He had a tough time in fulfilling the needs of the family. Being the only bread winner of his family and due to low income he was unable to look after his parents, wife and children in absence of work. As a daily wage labour his income very low and got two to three days in a week to work. He says with my low income it was very difficult for me and to meet the educational needs of my children and all other needs of wife and elderly parents. I was unable to run the family. In this difficult juncture he met community animator of BDVS, who helped him to get support from BDVS. Through animators continuous visit and good motivation, Ajit joined the youth group(formed by BDVS). 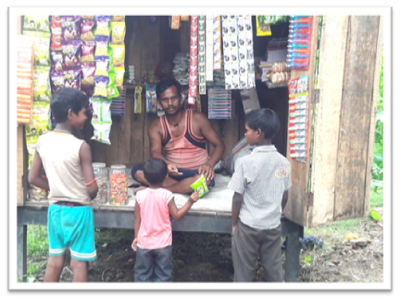 By seeing his urgent need, the youth group assisted him Rs 8000/ to start petty business by opening a small shop in his community. Slowly people started buying their day to day commodities from his shop and his business grew up. And now he runs his business inside a wooden cabin and he earns Rs 200/ to Rs 300/ per day. Now this has become great support for him to look after his children and family. “I am grateful to BDVS animators for his continuous motivation and thankful to youth group for their financial support” says Ajit.